When you go for a domestic traveling, probably a few transportation come up to your mind, such as airplane, train, or your car. 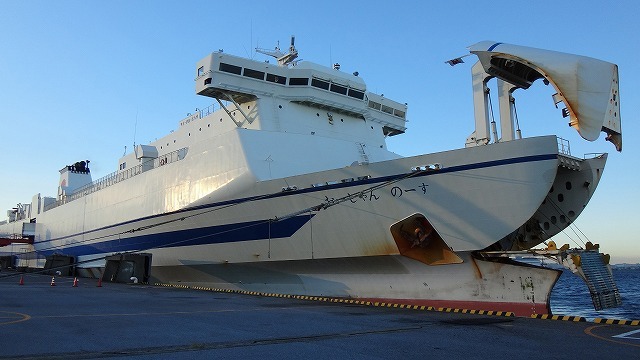 Ferry does not appear in your mind very often, does it? Apparently it seems expensive to ride on a huge luxury ship for 2 or 3 days trip, but actually it may not really expensive, depending on the case. 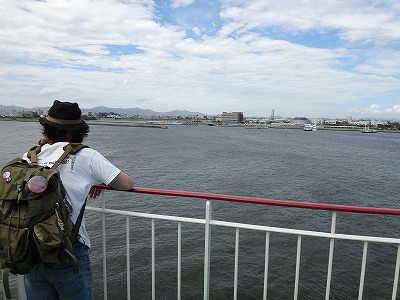 The writer of this article actually planned for a trip by ferry with his wife, and went from Tokyo to Tokushima prefecture, southwest part in Japan. 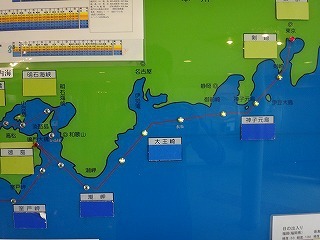 First, they came to Ariake-port ferry terminal in Koto Ward of central Tokyo. 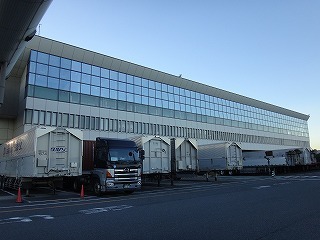 This is the terminal. 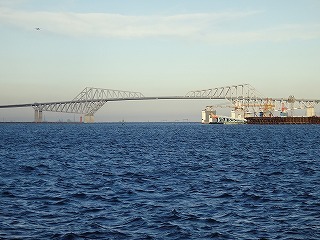 The new Tokyo Gate Bridge just front of the port. 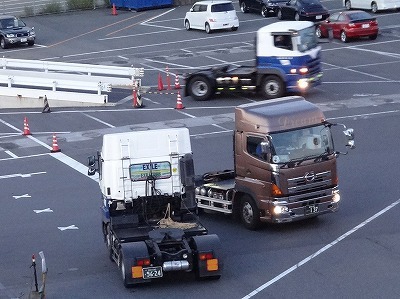 Many trucks were busily running around the area. This is the ship they ride. It says “Ocean North”. 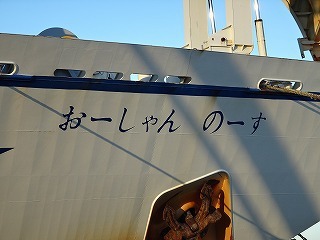 The name of the ship was “Ocean North”, written by Hiragana letter. It is because Hiragana is readable easily by everyone even from a distance, according to a staff’s talk. The ticket from Tokyo to Tokushima was being discounted to 20,000 yen (US$250) for two of them (including their car) at that time. The regular price is 44,980 yen (US$570), so they got it for a song! 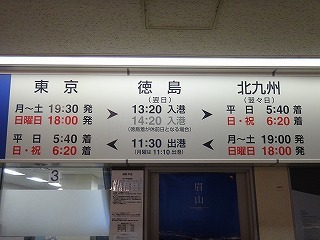 This is the transport schedule. You can see how big it is. 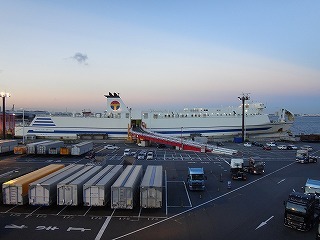 The transport schedule said that the ship departs at 19:30 from Tokyo, and arrives at 13:20 on the next day at Tokushima port. It will take almost 18 hours. 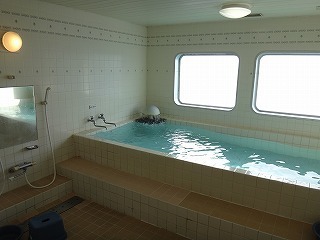 It’s long actually, but you can lie stretched out on a bed, take a bath, have a meal, and move around anywhere at anytime on the ship unlike the airplanes or trains, probably it’s just like the normal life. They rode on the ship by their car. 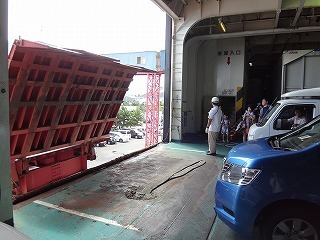 They felt excited about their first challenge to ride on the huge ship by car, and were looking forward to making an excursion to southwest part in Japan. 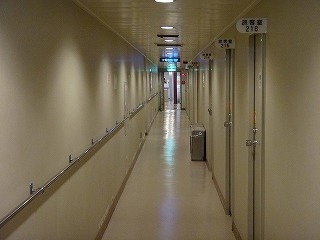 Long narrow hallway. 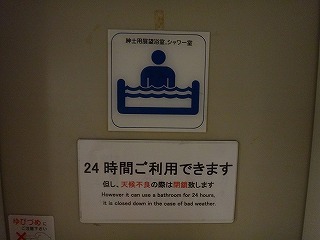 There were 2 beds in the room. 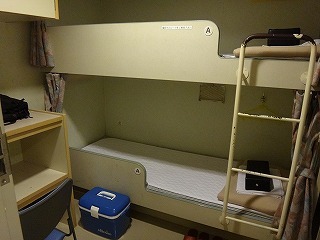 There were several types of rooms, like for 2, 4, 6 and 20 people. This time they got for 2 people, so they were able to spend their time without worrying about any privacy things. There were two desks in the room and two power plugs near the desks. 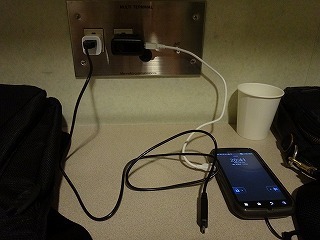 You can use PCs or charge your cell phones. You can use any electronic devices. Even though it was before the departure, their excitement already had been risen to their highest pitch. This is a food court “Ocean Plaza”. Vending machine for noodles. 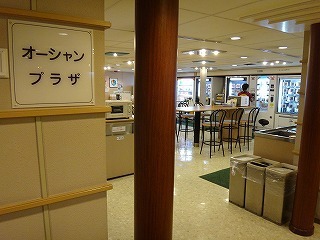 You can enjoy light foods like sandwiches and cup noodles at the food court. 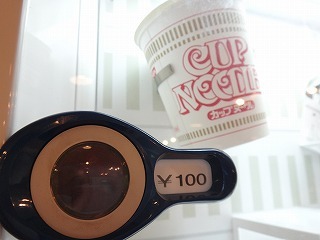 100 yen (US$1.3) for a cup noodle is reasonable. 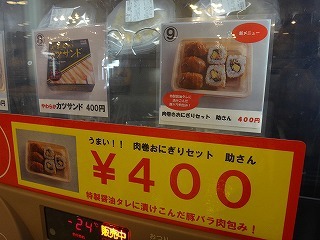 400 yen (US$5) for a pork rice ball set. Tokushima local cup noodles. A deep-fried pork cutlet sandwich set was 400 yen (US$5), and a pork rice ball set was also 400yen. 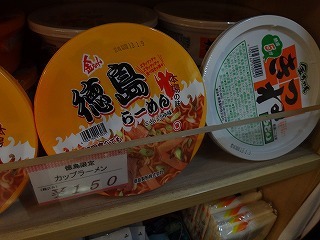 Tokushima local cup noodles were also available at 150 yen (US$1.9). It seemed there were enough variety of foods for 18 hours trip. You can walk around on the deck. Can you see the Tokyo Gate Bridge over there? 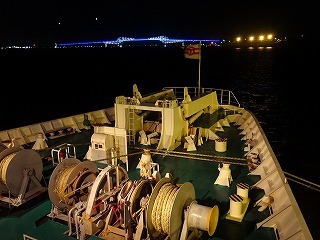 Finally the ship sails out of Ariake port, toward the beautiful blue Tokyo Gate Bridge. 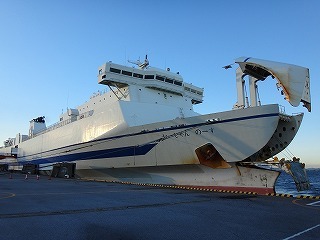 The ship rolled but little, so they slept very well even they forgot to take photos and report for this blog. When they woke up, it was already in the morning on the next day. You can enjoy beautiful outside view having coffee. The shared space by the window with the power plug. 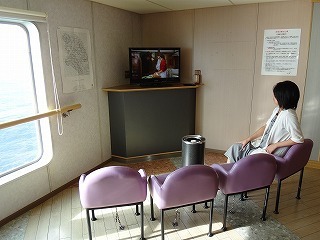 You can watch TV here. 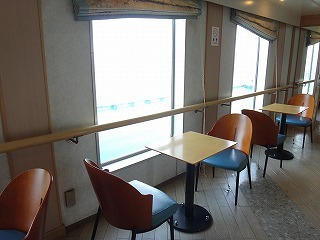 There were many places like this, people can enjoy the view and have some coffee. The weather was nice and calm, they spent a comfortable morning. This is the map displaying the course and present location. Available for 24 hours except when the bad weather. Wide clean bathroom. You can see the beautiful ocean view from the bathroom. It’s so wonderful. After taking a bath, they went up on the deck again. The ocean spreads all over the eyesight. Sometimes the lands can be seen. While watching the view, they saw flying fish flying on the sea, they were lucky to see those. 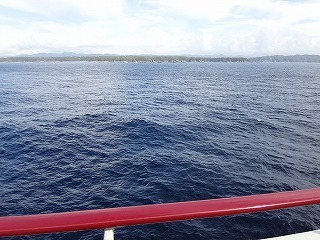 Shikoku island over there. It’s almost the goal. 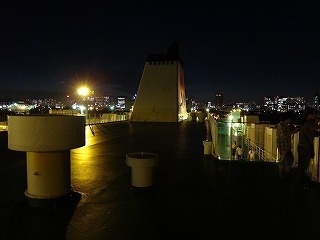 Though the man on this photo is not the writer, the ship finally approached to the destination while they were watching the outside view on the deck. 18 hours trip sounds long and boring, but they didn’t feel so long and boring. Getting off the ship by car. Having satisfaction, the couple got off the ship with their car. 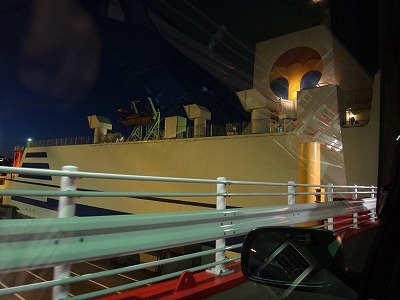 Driving on the road in Shikoku Island, they enjoyed nice view of Tokushima, and stopped by some souvenir shops and restaurants to enjoy the local meals. Now we have seen the trip by ferry through his report. What do you think? 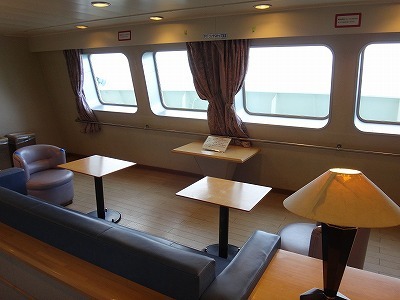 The trip by ferry seems more comfortable than I expected, it looks really nice. 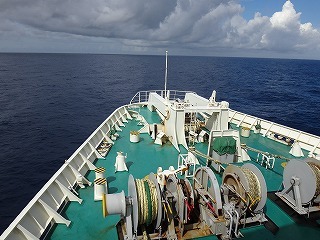 I would like to try some day, without worrying about seasick.